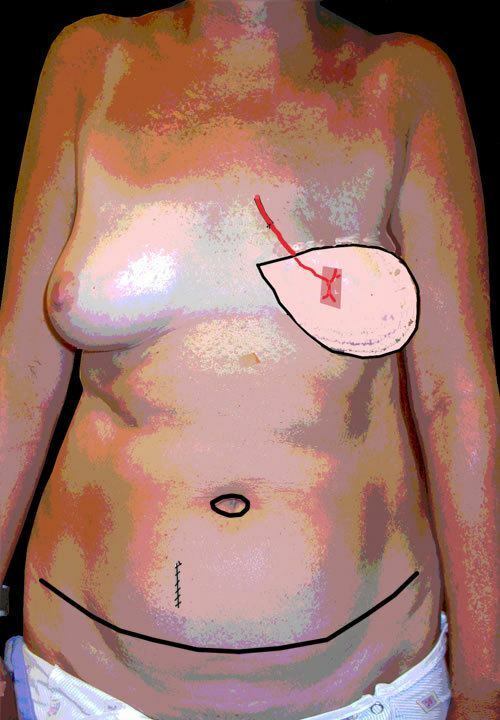 All of the following flaps are methods of reconstructing the breast from your own excess abdominal tissues. The abdominal procedures (pedicled TRAM, free TRAM, DIEP, SIEA) all utilize the same skin incisions and use the same tummy tissue, but differ in which blood vessels supply the tissue when transferred. All of these methods except the pedicled TRAM require specialized microsurgery. Procedures that use breast implants can be accessed at the bottom of the page. 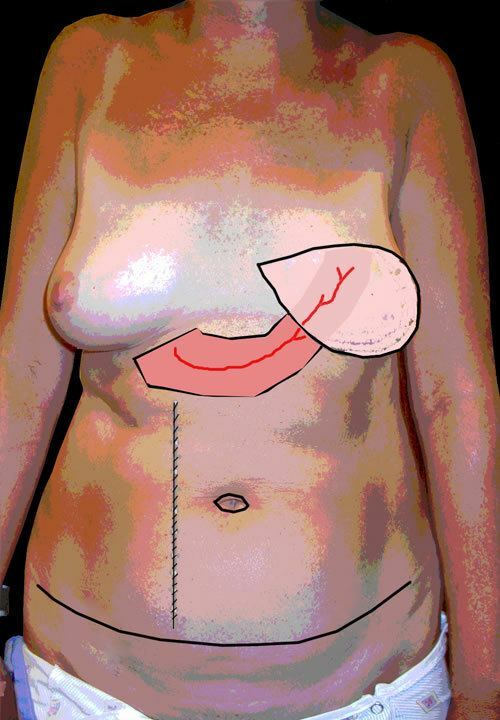 Longtime the “standard” of tissue breast reconstruction, the pedicled TRAM flap uses the superior epigastric vessels to supply the lower abdominal tissues through its attachment to the rectus muscle. The entire rectus muscle is used, divided from its lower attachment to the pubis. The purpose of the muscle is solely as carrier of the superior epigastric blood vessels. It is not a functional muscle, and there is some functional loss from its sacrifice. Most women tolerate this loss well, noticing no difference in their level of activities. A tunnel is made from the abdomen to the chest and the tummy tissues, attached to their muscular leash, are passed onto the chest for reconstruction. This is a variation on the standard pedicled TRAM flap, designed to improve blood supply to the TRAM and limit abdominal muscle loss. In the free TRAM variant, only a small patch of muscle (so called “muscle-sparing”) is taken and is based on the deep inferior epigastric artery. This vessel is the primary blood supply of the lower abdomen and therefore provides better blood supply than the superiorly based pedicle TRAM. This often allows a greater amount of tissue to be transferred for reconstruction and is preferred when patients have been previously irradiated as part of their cancer care. So called “perforator” flaps represent the state of the art in breast reconstruction. Similar to the free TRAM flap, the blood supply is based on the dominant deep inferior epigastric system, but unlike the free TRAM, no muscle is harvested. Blood vessels are dissected through the muscle and are removed with the flap, leaving the muscle intact and functional. Large enough perforating vessels must be present in a given patient to perform this safely. Exactly which of these abdominal flaps can be performed in any given patient cannot be determined in advance. At the time of surgery, the supplying blood vessels are examined and the best blood supply to the tissue will be taken. When possible, SIEA is performed first. When not possible, DIEP is performed next. When not possible, a muscle sparing free TRAM is performed. If no blood vessels can be found to attach these flaps to, a standard pedicled TRAM is performed. At times, back tissues can be used for breast reconstruction. Rarely, there is adequate back tissue to recreate an entire breast. More commonly, the latissimus flap is used in conjunction with a breast implant or tissue expander. 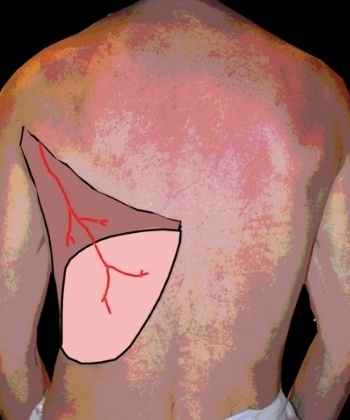 The skin and fat of the back are carried on the latissimus muscle which is divided from its origin on the back and rotated through a tunnel onto the chest. The muscle is no longer functional after transfer. Like the rectus described above, the muscle merely carries the blood supply. Surprisingly, there is little loss of function with this flap and most patients report no changes in their level of activity. Not everyone requires flap surgery. Dr. Zenn has been using fat grafting to prepare the radiated tissues to be able to accomplish normal implant reconstructions without flaps in selected cases. Typically, the irradiated skin will not stretch and therefore use of tissue expanders and placement of implants are not possible without adding tissue from the abdomen or back. By placing fat grafts in three or four occasions over a period of months, the skin becomes “normalized” and Dr. Zenn has been able to complete implant reconstruction without flaps. See the video below.